Posts categorized "Works For Me Wednesdays"
OK, maybe not a "gazillion," but enough meals to make your family think you're an amazing magician in the kitchen! I love to impress my hungry, fork-stomping brood with my ability to whip up an impressive dinner in a matter of minutes. I've already shared my Rotisserie-Chicken love affair with you. And now I spill the beans on my other paramour, the smoked sausage. Simple, elegant, and good gracious! It's PRE-COOKED! Move over hot dogs, there's another chopped, pressed meat in town. I like the Skinless variety because it's, well, skinless. So get your apronon and try a few of my favorite ways to use this edible chameleon. Start (pretty much any) meal preparation by sauteeing up some onions. Throw in some red or green peppers in for color. At this point, your family will be drooling in anticipation, because they can tell you're working on something good in there. While that is starting, slice up any other veggies laying around (you know you have some!) like zucchini, broccoli, carrots etc. and toss those in. Add sliced smoked sausage at the very end, and voila! A colorful, flavorful dish to serve over rice. Serve the above next to couscous. I love couscous because it only takes 5 minutes. You CAN make this from scratch, but why? There are many mixes like this, but here's one brand I've used. NOTE: I add 1/2 cup rice and 1 cup water to the mix so it's not too spicey. Add sliced sausage during the last 5 minutes and serve with chips and cheese. Start up your onions and veggies, like in the first recipe. Add sliced sausage. Cook up some pasta (ziti, penne). Toss all together with prepared Pesto to taste. To this you can add feta cheese, slice olives, etc. 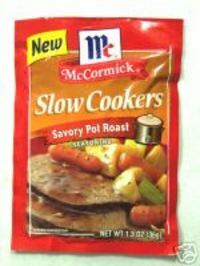 You might want to serve this on some nice china with crusty bread. It's so good your head will explode from all the compliments you'll receive. This is an actual monthly menu category. Sausage can be substituted for bacon or ground sausage patties, etc. Easy: sauteed onions and sausage, served on a toasted bun with melted provalone cheese. For more recipe ideas, Eckrich has plenty. 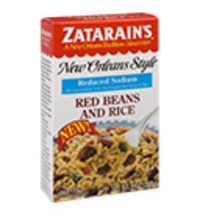 AND they have printable coupons! Go getcha some! This week I noticed that my grocery store had their store brand for "Buy One Get One Free" and since they have a long refrigerator life, you can stock up on an extra package or two. Perfect for having on hand during the holiday rush of activities. For more Works for Me Wednesday ideas, go visit Shannon! I even included about 8 recipes using my secret weapon in the war against family starvation. You KNOW that takes some time! So I get up this morning to publish my "Draft" only to find that it does not exist. Maybe I'll have better luck next week. 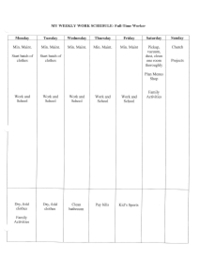 Last Wednesday, I posted a simple weekly schedule that helped me when I did not work outside the home. It doesn't resemble ANYTHING like what I live with today. With just one (low-maintenance) child left at home, life looks a whole lot different than it did even two years ago. While the heavy duty years of diapering and homework-helping are behind me, our family business has required more of me than I would like, and I now pretty much have to fly by the seat of my pants. My schedule changes from day to day. I might be up on ladders on a job-site one day, and then in day-long business meetings the next. Sometimes I drive all over the Dallas/Ft.Worth area, and sometimes I am home in my sweats in front of the computer. 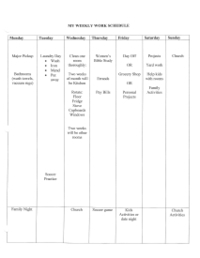 I've tried to organize my days, but a truthfully, a systematic weekly schedule doesn't work for me right now. I rely on my very helpful husband, Tom, Minimum Maintenance and a fairly well-stocked pantry make it through. Since statistics show that most women work full or part-time, this week's sample schedule might be more helpful. It is really very simple, and maybe it will work for you. Make a blank 7-Day table, like my example below. 1. Start by plugging in your work schedule. If you are a nurse or work odd shifts, you might have two or three sample schedules that you could make, depending on your week. 2. Write in standing commitments: church, sports, date night (ha!). 3. Swallow hard, but press on. 4. This is where it gets interesting. Think: how many loads of laundry does it take to keep your family operational? 5? 10? Chances are you will need to split up that job thoughout the week, or enlist help from the able bodies who are slumped in front of the video games. It can be ugly, but you are taking control. 5. Ask yourself: how clean does my house need to be, really? Do I need 6 hours on Saturday to clean, or can it be done a little at a time each evening? 6. Grocery shopping for my family takes me a minimum of 2 hours, start to finish. It has to go somewhere. Some moms hit Walmart at 10 pm and I admire that. Ya'll are made a tougher stuff than me. Pick a time and try to stick to it, if possible, so you aren't going every night. 7. Will Saturday work as your clean/shop/sports and entertainment day? Or do you need Sunday afternoons to get some of that done? 8. Notice I have "Min. Maint." typed in each day. Girls, hear me now and believe me later, this is the single best thing a working or "non-working" woman can do. You need to get your kids to pitch in for 5 minutes each day to pick up the messes everyone has had a hand in creating. Let your family know how much you appreciate their help, even the grumpy help. 9. I've left this sample schedule fairly blank on purpose. I just want you to get the idea, without over-complicating it. I think when you start putting your family activities and responsibilities on paper, you'll be amazed by all you are already doing! Give yourself a pat on the back. 10. Eliminate, eliminate. You don't need to be Room Mom, even though you are really good at it. You don't need to be on the Search Committee at church, an Awana leader AND have your kids in Future Problem Solvers. Ay, ay, ay! Learn to discuss activities and see how they will affect your family BEFORE you commit. Seriously put everything on the table, and start making some choices. Most of us choose to be busier than we have to be, and our families suffer for it. Final thought, from one Type T (tired) Mom to another. There are many days that I feel defeated. Maybe I've tried to do more than humanly possible, or I've forgotten some important thing. Sometimes there is just a feeling that something is missing. To combat that, I ask myself: What does this child need most right now? What does my man need most right now? What small thing can I do that will make a difference in this day? Often it is the extra five minutes spent staring into the darkness, listening to a child talk about his day before closing his eyes, that makes that pile of undone things seem less important. OK, so the troops might have to dig for undies tomorrow, but if you got to talk, got to listen, got to see those precious faces light up when you remembered to be silly with them, then you know you're going in the right direction. And that's what it's really all about. For more Works For Me Wednesday Tips, see Shannon at Rocks in My Dryer. Sanctuary in Suburbia. Not the Impossible Dream! It seems easy to think of my Barn House as a sanctuary. Because of its location, a few miles out of town and tucked back from the road, you do feel like you've found a little unfashionable oasis in this busy world. But don't let that fool you. Cable TV, High Speed Internet, video games and the stresses of life are all still readily knocking at our door, just like it was when we lived in suburbia. The only real difference is that it is a lot quieter. For almost 20 years, we lived in your typical suburban neighborhood. At our last residence, our neighbors' houses were so close to us we could almost lean out our windows and shake hands with them. We could see into each others' back yards, and our front door was maybe 25 feet from a busy street. Our front yard was a small patch of green grass. And yet somehow we found ways to make it a home sanctuary. While we longed to move to Montana, or at LEAST to the piney woods of east Texas, the years went by and we had to make do with what we had. It wasn't perfect, but it did seem like we owned a little slice of peace in our cookie-cutter world. I've thought back to those days and realized that we still do most of the same things now that we did then. We didn't move to a sanctuary,we brought sanctuary with us. 1. Start at the front door. A pot of flowers and a swept front porch says "Welcome." Not just to visitors, but to your family. Some years we didn't have the time or money to put in a big show of annual flower beds, but a few blooms in a pot is always the first thing that says "I care about this place" to anyone who comes through the door. 2. Make a grand entance. Our last house had a PITIFUL entryway. You opened the front door and would nearly run into the steps upstairs. Our lovely Barn House has a sliding door that opens into the kitchen--so tacky. But regardless of our lack of a grand entryway, I ask myself: "What is the first thing my family (or visitors) will see when they come it?" The clutter of mail, shoes, toys, and in our case, dirty dishes? Take a few minutes each day to tidy that up. Be vigilant about the "Drop Zones" and have everyone put their backpacks and papers where they belong. 3. Turn down the noise level. At one point, our neighbors played their music so loudly, it vibrated the pictures on our walls. So pleasant. We had to confront that issue and it nearly came to blows. Our other neighbor's dog barked incessantly. Incessantly, I tell you. That confrontation didn't go well either. But the things we could control, the TV, radio, stereo, children's voices, we worked on. I always felt that kids didn't need to be yelling in the house. Not at me, not at each other, not for fun. Take it outside, kids, or face the consequences. 4. Have some good smells coming from the kitchen. Hey, the Pillsbury crescent rolls smell almost as good as home made, so that counts, too. Even fishsticks and tater tots taste better when eaten together. 5. Guard your family time. My sister Katherine has a great post about this. Our kids used to think we were mean and unrealistic about requiring family time, but I think it paid great rewards. As my husband, Tom, likes to say, "This isn't a way-station, where you just change clothes for the next event. You gotta live here, too." So what if your kids say there's nothing to do here. So what if you're bored. Boredom is good. 6. Create a sense of Order. OK, this is a whole post in and of itself. I will post a complete thought on this on Friday, so stay tuned for that. For today, I will mention Minimum Maintenance. Minimum Maintenance is simply recognizing that a there is a minimum amount of effort that needs to go into each day to make it work. It is a morning (or evening) run through of the house, picking up and straightening. I spend NO MORE than 5 minutes per room, (15 minutes in the kitchen). This isn't a heavy-duty cleaning process, but it is enough to make me feel on top of my day. I've said before how much a timer has helped me, and I encourage you to see how much you can accomplish in 5 little minutes! 7. Have a sense of fun. Life can get to be awfully heavy with responsibilities and stresses. Give your children the gift of joy as you look for things to enjoy and treasure each day. In our city life, we played in the backyard, made forts in the living room, and ate cookies whenever possible. We didn't have wide open spaces to run around in, but we had each other and we made some great memories. Regardless of where your sanctuary is, it is really all about the people who live there. I come back to my theory that Peace, Order and Beauty is the three-legged stool that Sanctuary rests on. Ask yourself: in which of these areas can I improve how my home operates day-to-day? My challenge has always been the clutter that threatens any peace and beauty that's going on. Maybe you are there, too. I know I will never be as organized as Laura the Org Junkie, but on Friday I will share more on what has worked for a struggler like me. Works for Me Wednesday, hosted by Shannon at Rocks in My Dryer. Here are a few tricks to make your next painting project look like you actually hired a professional to do the job. 1. TAPE OFF! Tape off all your trim with the blue painter's tape (3M). Don't try and make straight edges with your paintbrush, it'll never work, and it's the first thing that makes your paint-job look bad. 2. Don't just tape off, burnish the edges of the tape. There's nothing worse than pulling tape and finding that paint has seeped underneath. So take your thumbnail and pull it along the edge to seal it well. Try and work the tape into gaps and over bumps. 3. If the wall is too bumpy or the woodwork too far gone to make a clean tape job, try this! Take a small cut-in brush and run a small amount of clear sealer (Minwax) or paint in the color of the trim along the taped adge. The paint that seeps underneath will be the color of the trim, and then it seals the edge for your new wall color. Paint right over this "edge primer" when it dries. 4. Take the time to cover everything. If you're like me, you are anxious to get to the fun part and are tempted to skip actually covering the floor and furniture. The giddiness of the moment makes us cocky. "I won't spill!" are my famous last words. This is a very big mistake, because anything that isn't covered WILL get a drop of paint on it. Guaranteed. Bonus tip: use the disposable plastic-backed paper tarps instead of plastic sheeting on the floor. Paint will get absorbed into the paper and thus, not tracked into other areas of the house. 5. Use enough paint. It's a bummer to have to buy 2 WHOLE gallons of paint when you only need 1 gallon and 1 quart to do the job. But it's better to have some left over that can be used for touch up, than to not quite make it around the room. A good paint job should look velvety, not skimpy. 5a. If you DO buy 1 gallon and 1 quart, mix them together in a larger container before you start. Gallons and quarts MAY have different formulas and MIGHT not match exactly. Mixing them together gives you one contiuous color. 6. Use the right tools. Rollers with too much "nap" for a smooth wall will put too much paint on the wall. Rollers with small naps will not load enough paint onto rough texture. You don't HAVE to spend big bucks on professional brushes, but PLEASE oh PLEASE don't use the 3.00 brushes with the stiff bristles. A good brush (when properly cleaned) will last many years. 7. Have rags/wipes handy for those inevitable spills. "Painter's Wipes" are great for removing paint, even dried drips and spots. I love these. 8. For tips on picking a paint color, you've got to read this for inspiration, and also try this. 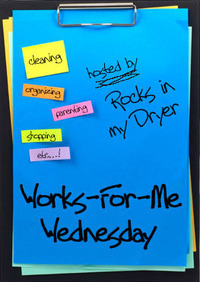 This week, Shannon at Rocks in My Dryer, is doing a backwards WFMW. Participants get to ask questions about issues that have stumped them...but since she ruled out quantum physics questions I'll have to think of a new one. Darn. Does anyone know anything about good, yet reasonable health insurance for the self-employed? Right now we are without health insurance and I am once again trying to find a solution that will work. I have just started checking out a Health Savings Account (recommended by Dave Ramsey) and would like to get some more information on that, too. Can anyone help me find matching laundry scents? I don't know why this bugs me, but I hate using detergent, liquid softener and dryer sheets that all smell different! Is there a brand that makes all three? Would it be too much to ask that packages be color coded by scent? Going down the laundry aisle makes me dizzy...too much to read! Help me out, here! Thanks, Fam. Love you, too. Here's a post I've had sitting in my "drafts" for several weeks. With two relatively easy potty trainings under my belt, I was totally unprepared for my third child's cycle of witholding and constipation that made it nearly impossible to beat. It took some patience and creativity to finally be successful. First, we tried to associate a pleasant experience with sitting (....and sitting...) on the potty. We had a stack of his favorite books, including a Nursery Rhyme book which came to be affectionately known as, "The Poopie Book." I still worry that my son will always feel the urge to go whenever he hears "One, two, buckle my shoe," but perhaps he can work that out with a therapist. We also looked at his diet. We cut back on the milk and increased the water, and tried to add more fruits and vegetables. Canteloupe was his favorite fruit and it was just the ticket. Then, we had to find the right motivation. Stickers, candy, and treats had no effect whatsoever. Not even Superman underwear could entice him into success. Finally, my husband hit on the Eureka idea. Our son loved to build things. Even at age two and three, he was always trying to put things together. We had some extra bricks laying around from an old building project, so my husband got him all worked up about building a tower with those bricks! One brick for every successful "brick" in the potty, you could say. as a monument to poopie success. Who'd a thunk? Something so simple could work so well! It was all about finding out what really got him excited and "thinking outside the boxers!" So, besides candy and stickers, what are some other offbeat motivations you could try?